The water hyacinth is a tropical / subtropical plant so that it begins to die in November in Japan. 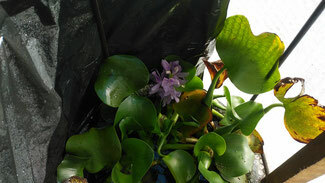 But, our water hyacinth in the cold-proof water tank for the killifish has vividly bloomed even in November. It looks tight because of the cold-proof sheet, but it may survive the winter at this rate.